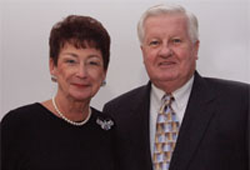 Ken Rzeszutko '61 and his wife, Dottie, have joined the Saint Patrick Board of Trustees recently but their dedication during their short time involved with the school has had a profound impact. In 2008, Ken offered to bring a new event, Run for the Shamrocks, to Saint Patrick. This event takes place at Arlington Park and includes an afternoon of racing, a silent auction and raffle prizes. Ken and Dottie Rzeszutko's company, CA Fortune, has underwritten the event for two years in a row and raised more than $85,000 for Financial Assistance. Ken has agreed, once again, to sponsor this event next year. In addition to generously supporting the "Run," the Rzeszutkos have joined other board members who have made provisions in their estate plans for St. Pat's. Why this sudden interest in giving back to St. Pat's? "It was time," Ken stated. Ken and Dottie were invited back to the school a few years ago for a reception. After meeting Brother Konrad and former trustee, Merri Dee, who explained all the good things happening at St. Pat's, they were hooked. One program that is near and dear to their hearts is the Financial Aid Program. Each year, the Rzeszutkos sponsor students who are in need of tuition assistance. And, the best part of sponsoring a student? "The letters," explains Dottie. Twice a year, the students who receive financial assistance write letters to their sponsors thanking them for their support and describing their experiences at St. Pat's. "We look forward to reading those letters and we save them. And we enjoy meeting the students at the Annual Benefactor's Reception." Ken and Dottie both grew up in the neighborhood near St. Pat's. While attending high school, Ken worked part-time at Jewel. After graduation, he enlisted in the Navy and spent four years at Great Lakes Naval Base working in the Central Surgical Supply unit. Because he was stationed close to Chicago, Ken was able to live at home and keep his hours at Jewel where he met Dottie who was a clerk. What started as a part-time high school job would eventually lead to a lifelong career in the food service industry. After being discharged from the Navy, Ken worked for Jewel and eventually took a position at a food brokerage firm. During this time, Ken was volunteering at his local fire department. When the Elk Grove Village Fire Department was hiring, Ken applied and became a fulltime firefighter. But, on his days off, he worked at Jewel and eventually landed a job as a food broker for a subsidiary of CA Fortune. In 1983, CA Fortune was up for sale, and Ken decided to purchase it. With Dottie as his business partner, Ken took over the business while still working for the fire department. After putting in 20 years as a fireman, Ken retired to put all his efforts into CA Fortune. Ken is currently President and CEO of CA Fortune, a specialty food brokerage firm that employs 50 people and sells to major retail grocery stores throughout the country. Dottie is Vice President and CFO. The company has managers in 15 states and has offices in Illinois and Wisconsin. Ken said that St. Pat's gave him a solid foundation on which to build. "After high school, there was no more time to build - so my years at Pat's were what mattered." The religious and spiritual instruction was high-quality and he felt his high schools years taught him honesty, how to be ethical in dealing with business and commitment. While Saint Patrick is fortunate to have such a dedicated couple, many other organizations have been the beneficiaries of their good will and desire to give back. Ken was a long-time member of the James Jordan Boys & Girls Club. Dottie has been actively involved with Arden Shore Children and Family Services for 20 years and volunteered for Cancer Treatment Research Foundation for 15 years. Currently, she is President of the Barrington Chapter of the Infant Welfare League where she has also been a member for 20 years. Saint Patrick High School is thrilled that the Rzeszutkos have partnered with the school and continue their support of the Shamrocks.